Do you own a beauty business or have to design a website for a wellness & spa-related client? Here are 25 best beauty WordPress themes you can choose from and use as a framework for your customized website design. Choose your favorite from the list below. This beauty WordPress theme was created for a beauty salon and contains lots of useful features for this type of businesses. It also includes the Slider Revolution plugin and was built on a 1140px grid. Coded with SEO in mind, this responsive theme is accessible, easily readable and looks perfect on any device. Paradise is a multipurpose beauty WordPress theme with a modern design. It can be used by business in the following niches: massage parlors, nail salons, tattoo shops, barbershops, hair salons and spas. 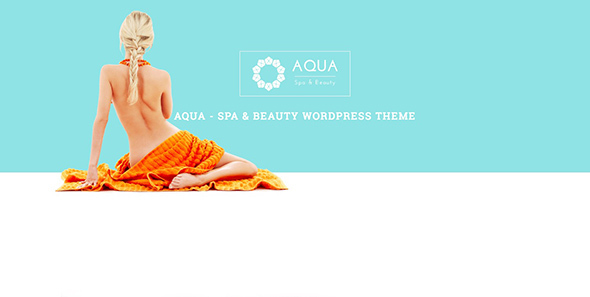 Aqua is another modern, responsive WordPress spa and theme that’s also WooCommerce-friendly. It has a clean, minimal design and can be used by massage parlors, spas, beauty salons, hair salons, wellness centers, yoga studios, and other healthcare business websites. Cosmetista is a makeup review WordPress theme for beauty bloggers. Use it to create makeup blogs, write product reviews, and even launch an online shop using the WooCommerce plugin. Grand Spa is a responsive WordPress theme for spa, beauty and massage businesses. Use it to build your WordPress site. It has a responsive design and it looks impeccable on any device. Beauty Center is a responsive WordPress theme for easily designing beauty salon websites or any other healthcare or beauty-related websites. It comes with a custom admin panel so you can customize every aspect of this theme, from colors to fonts, widgets and more. 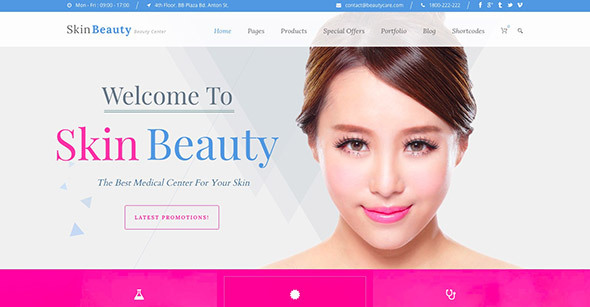 Skin Beauty is a beauty center WordPress theme with a modern, responsive design. Use it for any type of beauty-related service. 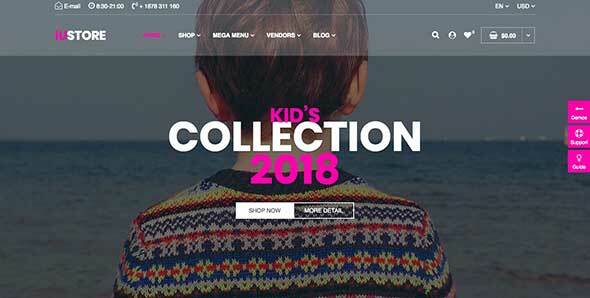 You can also launch a blog or an online shop with this theme. Haircut is the perfect theme for a hair salon presentation website. 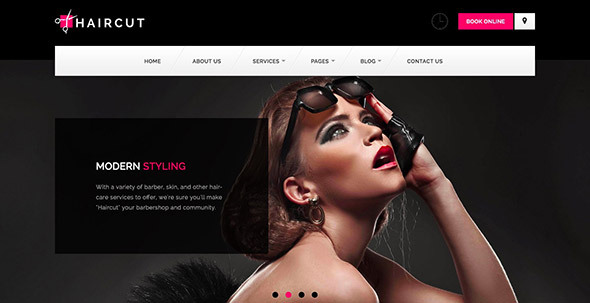 Use this modern WordPress theme for barbershops, hair salons, spas and beauty business websites. Customize it any way you please. 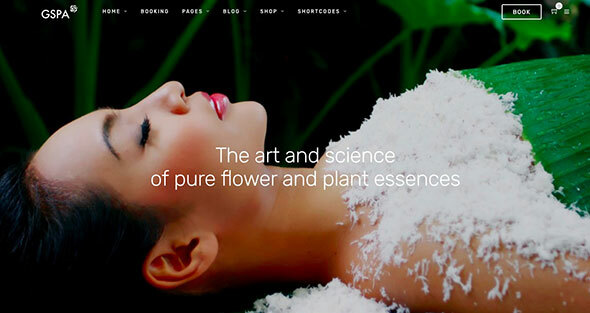 Beautiful is a modern spa and beauty WordPress theme that you can customize using the intuitive interface. Change the colors, fonts, page elements, anything you can think of to match your business’ branding. 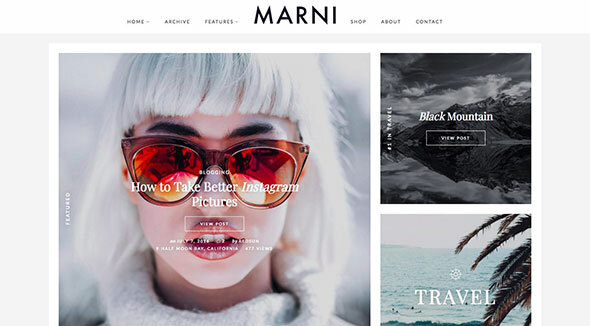 Marni is another great responsive WordPress theme, this time dedicated to bloggers in the beauty niche. It comes with a lovely homepage post slider and a lot of useful features for lifestyle blogs. 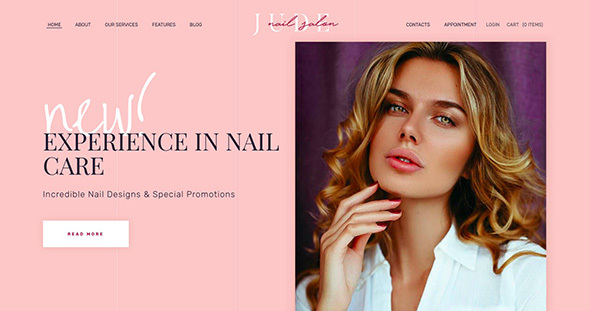 Jude is a clean WordPress theme for nail and beauty salons, though it can easily be customized to be a good fit for any kind of beauty service. It has a feminine, modern design with elegant details. Check out this minimalist, modern WordPress theme built for any business operating in the Hair and Beauty industry. Comes with a lot of useful features for a complex website. Beauty Pack is a 200+-page template with all you need for your beauty business presentation website. Set up your site in a few easy steps. Elaine theme comes with an easy-to-use admin interface with a lot of powerful features to customize your site. It has a one-click import of the demo site and a large collection of home and inner pages to get you started. Launch your beauty business presentation website in just a couple of hours with this pre-made website theme for WordPress sites. You can integrate an appointment system, create custom post types, and more. Spa Lab is a beauty salon WordPress theme with powerful features. Use the two types of menu card designs, reservation system, gift card system and more, to power up your site! 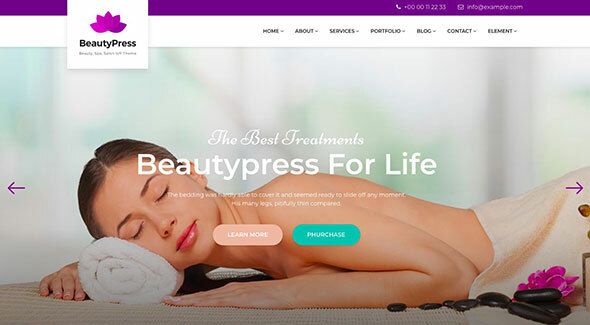 BeautyPress is a wellness WordPress theme with a clean and responsive design. Comes with a large slider on the homepage, a portfolio feature, and more! 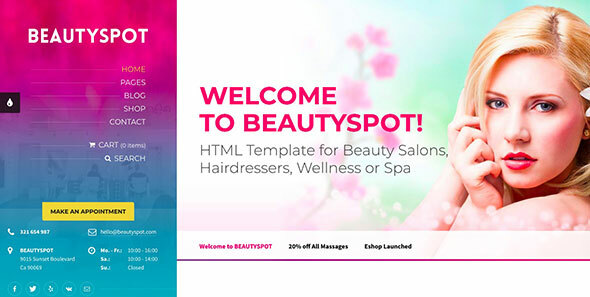 BeautySpot is another great WordPress theme for your beauty salon. Easily customize it with your own color scheme in a matter of minutes. 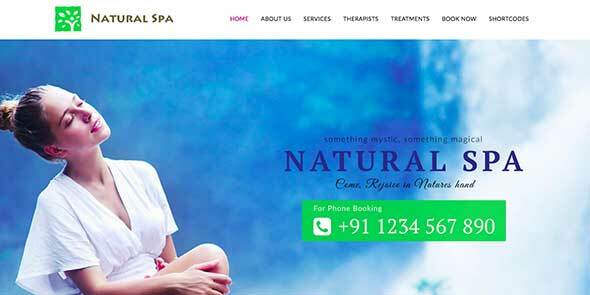 Nature Spa theme is the perfect premium WordPress theme for Spa and health resorts. Comes with pre-made pages for services, treatments and a fully functional appointments system. This responsive e-commerce WordPress theme can be used to sell beauty products, cosmetics, makeup and more. Easily adapt it to your brand’s needs. MakeUp is a WordPress theme for makeup artists, beauticians, and other beauty businesses. The pre-designed pages and custom shortcodes will help you launch your presentation website in a matter of hours. 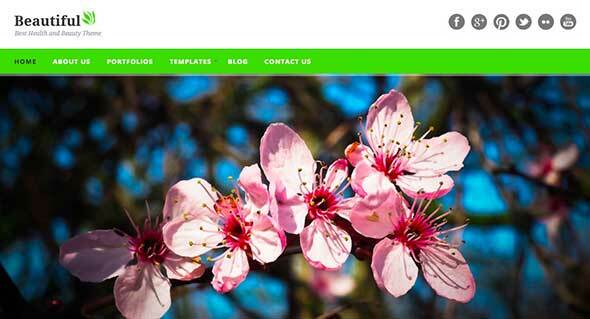 Blush is a highly customizable WordPress theme with no coding knowledge required to edit its options. It has a one-click demo content import, it’s fully responsive and retina ready and comes integrated with the powerful Visual Composer Page Builder for WordPress. Check out this beautiful spa theme with tons of features for spa businesses. It has a clean, refreshing style and you can customize to fit your brand. 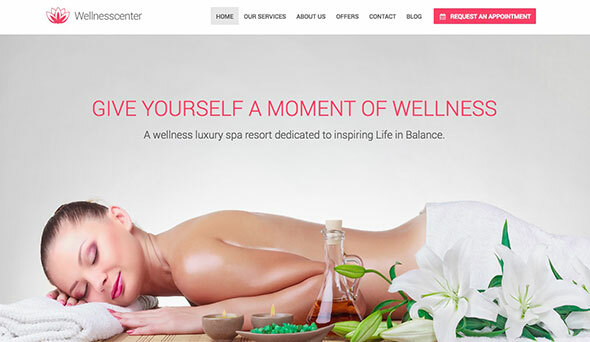 WellnessCenter theme comes with everything you need for your spa, salon or beauty parlor business. It has a powerful admin panel, a bookings system, and a communications system with your clients. 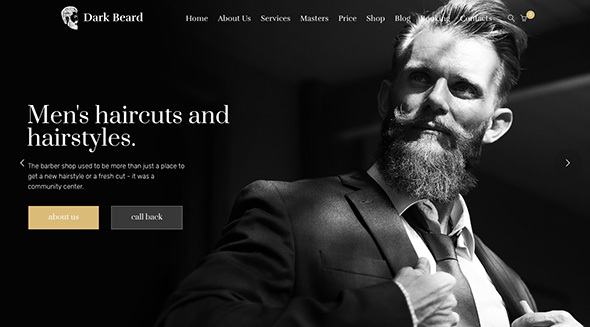 CutStyle is a modern WordPress theme for barbershops. It has a hipster design and can also be used as a personal website for a hair stylist.